Hey polo peeps. Hope you're all well and able to enjoy some of the Feb sun. Just wanted to share to stuff i tried out in my 83, mostly stock breadvan. I wanted music and DAB in my bready but am crap with wiring. Instead of choose a stereo and speakers and pay someone to butcher my door cards and interior to mount it all, i looked bluetooth speakers. So last year i picked up a jbl flip 2 speaker off *bay for about £30, with the intention of using it in place of a stereo in my breadvan. I'm not affiliated with them in any way, just read great reviews of thier products. I chose the flip because it's round and not square. The Roll by Urban Ears was also on my list as it's flat. It could just sit on the dash or even hang from the rear view/window winders, i just happened to get a flip first. Anyhoo, with a little hook and loop tape to keep it from sliding around, i managed to mount that bad boy in the mouth part of where the stereo would go. I've chosen to mount it there, as it's out of the sun, and also because it's black, it kinda blends in with the dash if i do decide to leave it in. 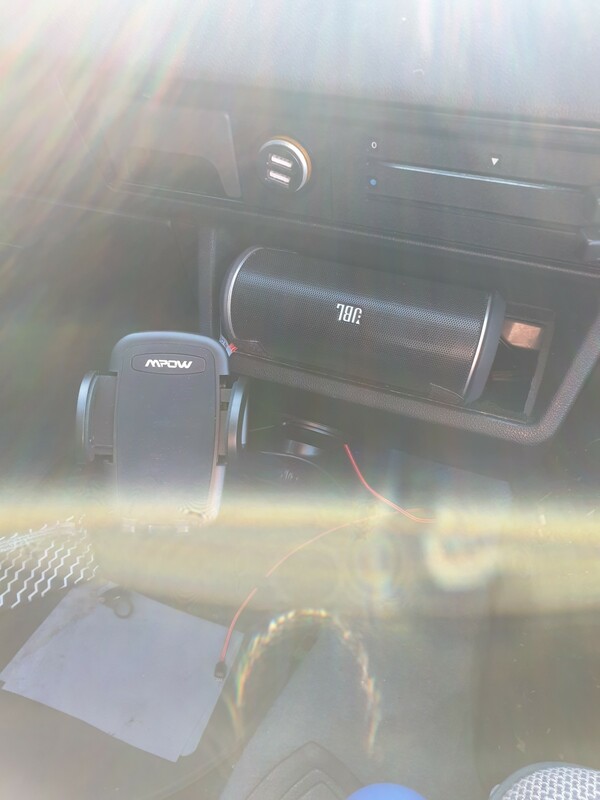 I recently picked up a phone holder from *mazon by a company called mpow. Their stuff has good reviews too. Seems to stick to the bumpy surface under the dash quite well but it's early days yet. Have to see how it goes in summer. My Mrs picked up a flip 4 a while ago and i decided to give that a whirl instead of the flip 2. It sounds better than the flip 2 with music. The flip 4 has wider frequency response so you get more lows. The speaker phone function is much clearer on the flip 4 than the flip 2. You can link up as many as you like so if a mate has one, or even a few mates, you can have tunes in the front and back. Potentially even as a convoy if you drove close enough together, and carry on when you get where you're going. Doesn't even have to be a flip. Can use one of those massive sub ones that jbl make. Any newer jbl will work. Can only have one flip 2 connected at a time as far as i'm aware. The flip 4 is also waterproof. However, there are advantages of the flip 2 over the flip 4. The controls on the flip 2 are on the end so if it's mounted as i have done it, you can adjust the volume without touching your phone. The flip 4 controls are on the back/top depending on where you mount it. The flip 2 fits nicely into the stereo recess, whereas the flip 4 is bigger. It will still fit using the hook and loop but access to the controls is restricted unless you mounted in the dash or modified the stereo recess to accomodate, which means adjusting volume, answering calls by touching your phone while driving. Which is naughty. The flip 2 is way cheaper and although can still attract thieves, is less desirable than the flip 4. The flip 4 has better battery life but i'm able to keep my flip 2 connected to power source so not a massive issue. Both are easily removable, so one less reason for some sketchy cockwomble to break into your car! At this point, i'm looking to keep the flip 2 in place. Being able to make and take calls is handy but not a deal breaker for me. I can still use and hear map app through flip 2 just fine. The fact the flip 4 sounds better with music isn't a big deal in a noisy car either. I can hear music on the flip 2 just fine. I also use a DAB app on my phone if i get bored of my tunes. Also good for traffic updates. As a side note, i did also try out the jbl trip speaker. Uses a magnet system to clip onto the sun visor. Great bit of kit but really only geared as a hands free phone speaker. Music sounds crap through it. If you have a decent stereo but want to do hands free, maybe that's the one for you. As i mentioned above, there are other options, Roll by Urban Ears is flat and it is possible to link more than one. I haven't tried that one yet but will keep an eye out for a cheap one to test. But yeah, bluetooth speaker works well, I've got one in the van and it's immeasurably better than the stereo that's fitted to it. Ha! Gotta love caveman mechanics.